Above is an enlargement of the flowers and flower bouquets shown in the adjacent florist shop sign, number SA28312. All elements of this sign are made from all-weather, High Density Urethane. 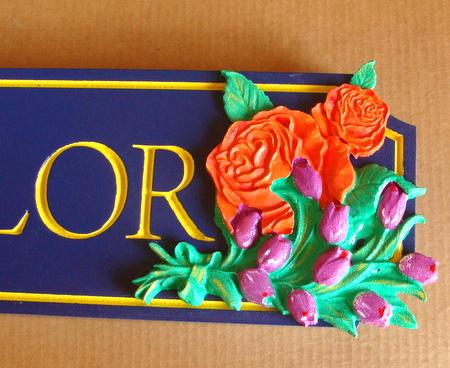 The sign features four 3-D carvings of flowers and flower bouquets which are then hand-painted. The sign background and raised outside border are painted in long-lasting automotive-grade enamels. The lettering and inside border are engraved and inlaid with 24K Gold-Leaf gilt. Finally, the sign is clear-coated twice, making it ready for either indoor or outdoor use.